Carefully cut your butternut squash in half, lengthwise. If you can't do it, I did it short-ways and ended up having 4 butternut squash halves (or I guess quarters). Clean out the seeds and membrane. Put the 4 butternut squash pieces flesh side down on a large jelly roll baking sheet. Pour 1 cup of water into the pan. Gently place baking sheet into oven and bake for 45 minutes. Let cool for 10 minutes before scraping out the (now) soft flesh and placing into a food processor or blender. 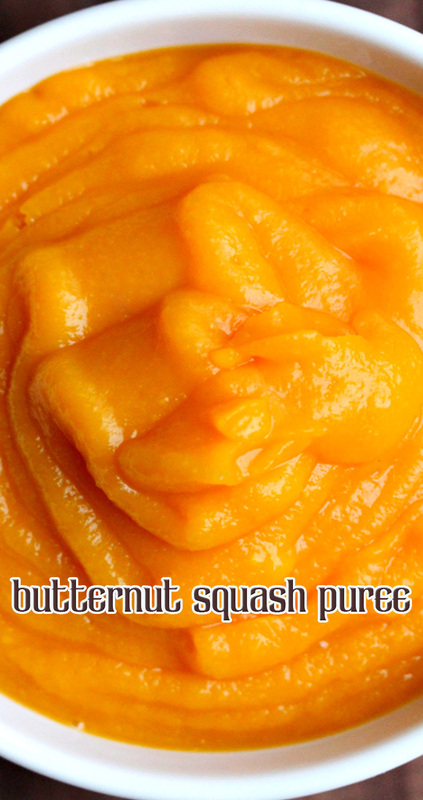 Blend the butternut squash together and add some salt. If it gets too thick to blend, you can add a bit of water to get it going. Store in airtight container for up to 3 days in the fridge.